The basis is an ordinary turntable. 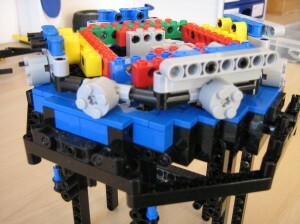 To the lower part a stiff table is attached, consisting of 2 layers of Technic bricks, fitted crosswise on top of each other, with tiles (blue) in way of the rollers. 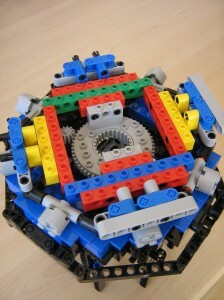 The rollers (gray) are fitted to an octagon shaped cage, which is connected via the multicoloured construction, to the upper part of the turntable. All the black parts below the turntable will be the octagon shaped crane pedestal (circular in reality) and the rotating part of the crane will have to be atttached to the part above the rollers. The upper part is driven by a medium PF motor, through a reduction.